In this post that is part of my series on implementing continuous delivery with TFS we look at the sample application that will be used to illustrate various aspects of the deployment pipeline. I've chosen Microsoft's fictional Contoso University ASP.NET MVC application as it comprises components that need to be deployed to a web server and a database server and it lends itself to (reasonably) easily demonstrating automated acceptance testing. You can download the completed application here and read more about its construction here. Out of the box Contoso University uses Entity Framework Code First Migrations for database development however this isn't what I would use for enterprise-level software development. 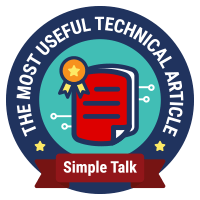 Instead I recommend using a tool such as Microsoft's SQL Server Database Tools (SSDT) and more specifically the SQL Server Database Project component of SSDT that can be added to a Visual Studio solution. The main focus of this post is on converting Contoso University to use a SQL Server Database Project and if you are not already up to speed with this technology I have a Getting Started post here. Please note that I don't describe every mouse-click below so some familiarity will be essential. I'm using the version of LocalDb that corresponds to SQL Server 2012 below as this is what Contoso University has been developed against. If you want to use the LocalDb that corresponds to SQL Server 2014 ((localdb)\ProjectsV12) then it will probably work but watch out for glitches. So, there is a little bit of work to do to get Contoso University converted, and this post will take us to the point of readying it for configuration with TFS. Download the Contoso University application using the link above and unblock and then extract the zip to a convenient temporary location. Navigate to ContosoUniversity.sln and open the solution. Build the solution which should cause NuGet packages to be restored using the Automatic Package Restore method. Delete SchoolIniializer.cs from the DAL folder. Remove the Migrations folder and all its contents. Expand the ContosoUniversity2 database from the SQL Server Object Explorer window and delete dbo._MigrationHistory from the Tables folder. Run the solution to check that it still builds and data can be edited. Add an SSDP called ContosoUniversity.Database to the solution. Import the ContosoUniversity2 database to the new project using default values. In the ContosoUniversity.Database properties enable Code Analysis in the Code Analysis tab. Create and save a publish profile called CU-DEV.publish.xml to publish to a database called CU-DEV on (LocalDb)\v11.0. In Web.config change the SchoolContext connection string to point to CU-DEV. Build the solution to check there are no errors. In the SQL Server Object Explorer window expand the tree to display the ContosoUniversity2 database tables. Right click a table and choose View Data. From the table's toolbar click the Script icon to create the T-SQL to insert the data (SET IDENTITY_INSERT ON | OFF should be added by the scripting engine where required). Save the file in the ReferenceData folder in the format TableName.data.sql and add it to the solution as an existing item. Use the SQLCMD syntax to call the file in the post deployment script file. (The order the table inserts are executed will need to cater for referential integrity. Person, Department, Course, CourseInstructor, Enrollment and OfficeAssignment should work.) When editing Script.PostDeployment.sql the SQLCMD Mode toolbar button will turn off Transact-SQL IntelliSense and stop ‘errors' from being highlighted. You should now be able to use CU-DEV.publish.xml to actually publish a database called CU-DEV to LocalDB that contains both schema and data and which works in the same way as the database created by EF Code First Migrations. Remove the ContosoUniversity ASP.NET MVC project from the solution and rename it to ContosoUniversity.Web. In the file system rename the containing folder to ContosoUniversity.Web. Add the renamed project back in to the solution and from the Application tab of the project's Properties change the Assembly name and Default namespace to ContosoUniversity.Web. You may need to close the solution and reopen it before checking that nothing is broken and the application runs without errors. That's it for the moment. In the next post in this series I'll explain how to get the solution under version control in TFS and how to implement continuous integration.